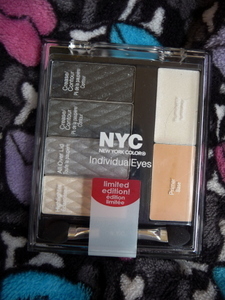 The NYC IndividualEyes eyeshadows was the first product I tried. The one I received was 0156-08 Dark Shadows. I was not too impressed with the product. I didn’t like the colors too much and didn’t feel it had great pigment. It comes with 4 eyeshadow colors plus a primer and illuminator. I wouldn’t purchase this product. It retails for $4.99 and comes in different colors. 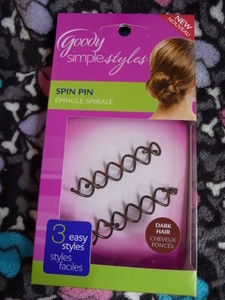 I tried the Goody simple styles Spin Pin a couple times and really like it. It is a unique way to put up your hair without using a hair tie. This is how it works: you twist your hair into a bun, then take one pin and turn it clockwise into your hair. Take the second pin and do the same thing making sure not to intertwine it with the first pin. To take it out, you turn it counter-clockwise and it comes out without pulling your hair. I like it because it doesn’t pull your hair too tight or give you a headache like hair ties can do. It also seemed to leave my hair nice instead of creasing it. The problem is that it doesn’t do very much other than keep your hair in a bun. It also might take a few tries to get it to stay and may not work well for very long or thick hair. I have normal hair thickness and medium length. I do think they are really cool and would buy them in the future. They retail for $7.29. I also received a small 1.3 oz candle from bath & body works. 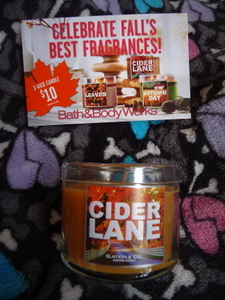 The scent is cider lane and smells heavenly! It is a cinnamony, caramely scent that reminds me of fall time. I have always loved bath & body works candles since they are so strong and usually have exotic and yummy scents. I loved this so much I went and bought a bigger one at the store. It came with a coupon for a $10 large candle (which usually costs $20), but it expired before I could use it. The best part is, they are having a sale right now for $20 for 2 candles so I got the same price anyway. If you love the smell of Pine trees I also recommend their fresh balsam candle, amazing! The mini candle I recieved normally retails for $3.50, the next size up retails for $10 and their biggest ones retail for $20. Of course they are always having sales and coupons for better deals. 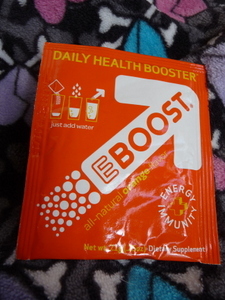 I tried the EBOOST daily health booster that you add to a glass of water. It contains lots of vitamins and I received the orange flavor. When you mix it with water it becomes very fizzy and thickens up a bit. I thought it tasted disgusting, almost poison-like. I took a few sips and then poured the rest down the sink since it tasted so bad. They have other flavors including pink lemonade, acai pomegranate and super berry, so maybe the orange is just not good. I don’t normally drink energy or vitamin drinks, and after tasting this one I wouldn’t recommend it. Since I didn’t finish it I can’t say if it actually works, but if you just eat healthy and take vitamins you don’t need to drink something gross like this. These retail for $28 for a box of 20 or $39 for a box of 30. 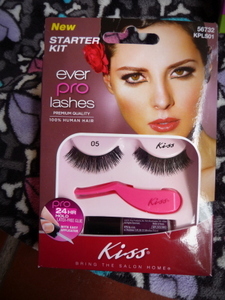 I have never tried fake eyelashes before, so I was excited to try the Kiss ever pro lashes starter kit. The kit comes with one pair of eyelashes, glue, and a tweezer-like tool to put them on. I had a hard time getting them to stick at the ends and it felt super odd wearing them. It could be just because I am not used to fake lashes, but these weren’t my favorite. They would have looked nice if I could get them to stick properly, but it didn’t work out well for me. The tool wasn’t very helpful either. These retail for $5.99. 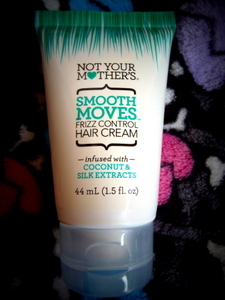 Lastly, I tried Not Your Mother’s smooth moves frizz control hair cream. Let me start off by saying it smells SO good! It is infused with coconut and silk extracts so if you love coconut, you will love the way this smells. You are supposed to put a small amount in your hand and work it into your hair after you have washed your hair and towel-dried it. You then comb it though your hair and blow-dry it or allow it to air dry. I have only used it once so far and let it air dry. I found that it did work very well and left my hair very soft. I was very pleased with this product. This product retails for $6.00 for a full sized 4 oz. bottle. Overall, I was very happy with the products I got to try. If you want to sign up for Influenster or know more about it you can read more here. If you would like to read more about the products discussed here, click here for more information. If you have any questions or just wish to comment about your experience with these products/brands or Influenster leave a comment below! 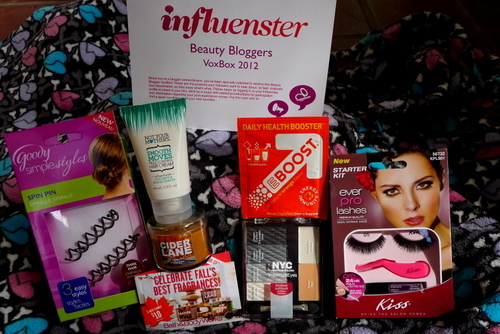 Posted on October 31, 2012, in Random Thoughts and tagged bath & body works, beauty, beauty review, beauty voxbox 2012, candle, eboost, fake eyelashes, Goody, Influenster, Kiss, makeup, NYC, products, reviews, VoxBox. Bookmark the permalink. 1 Comment.